Dominant TF: 60 mins & Daily (15mins time frames too). Market direction: congestion to down initially. Support level has been found around 794 for now, but 781 is probably stronger. Market direction: Congestion to Down. Support should be found soon. There is no indication that yesterday's recovery will take SPY much higher in the short term. A congestion is likely.MTFS had an early crossover which is generally not indicative of a strong recovery, but the lines gradients are now looking better. We shall however watch how negative entropy is dissipating over the next few bars. 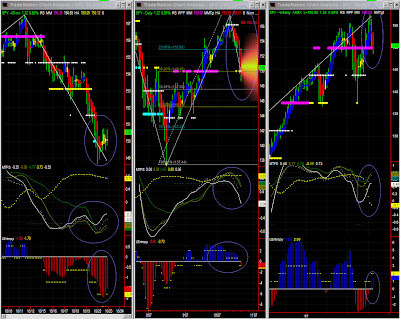 The 150 support level proved strong enough to stop the fall, but MTFS looks bearish, and bars are also decidedly red. The correction is maybe not over yet, and we have to possibly watch lower Fib retracement levels. 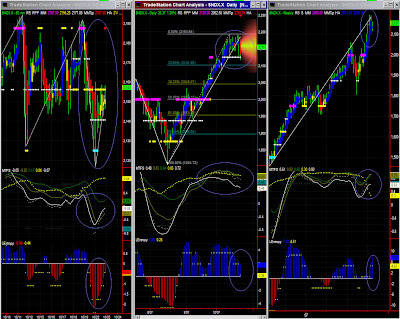 Weekly: Congestion, but caution: significance level is ridiculously low. For the time being, indicators still point very slightly upward, but the red bar is more reactive and negates any remaining positive momentum in the short term. We can see some divergence in AdStoK and a very low significance level at this time frame (divergence? ), so this is at best only a background information at the moment, and one should certainly focus on lower time frames (60mins and daily). 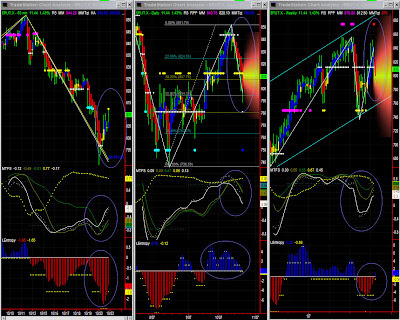 Market direction: Congestion to mildly up. 60mins: Congestion. Mild updward bias at first. Good recovery after hitting the 2125 support level very strongly. The level held and prices bounced to pivot level (MM + Fib). MTFS is undecisive, and Entropy is recovery, indicating an upward bias, however possibly bumping on pivot level.It is therefore not easy to see price behaviour going forward, and lower time frames do not provide more information at present. Bar colours have not even turned blue during this recovery. Current congestion in lower time frames can slow down or stall the upward bias we still have.Note that significance level on this time frame is falling, due to indicator divergence.